This electric dog grooming trimmer can give your dog a perfect look. ✔Low noise, low vibration-quiet enough not to scare dogs and cats. ✔3.7V superior rotating motor up to 7000 revolutions per minutes. ✔Whisper-quiet operation design and a stress-free grooming experience. ✔Stainless Steel fixed blade + Ceramic movable blade. ✔Dynamic LCD screen intelligently indicate remaining battery capacity avoiding interruption. 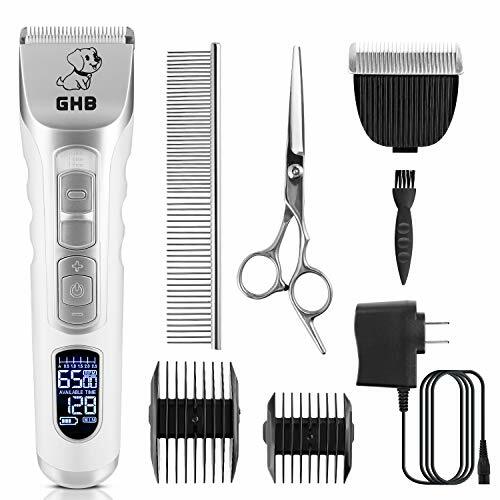 ✔Built in 2200mA rechargeable Li-ion battery, 3hrs charge with 6hrs long time power supply, perfect for long time grooming work. ✔White color design, perfect as gift for your friends and families. ●Please keep the grooming clipper away from fire and high temperature. ●We suggest you use the scissors to cut the long hair before trimming hair with the clipper. The grooming effect will be better. ●Please clean the hair frequently during use the clipper with attachment comb to prevent hair clog. ●The blade can also be removed separately from the machine. You can remove the cutting head and clean it in the water, you can easily remove the remaining hair hanging from the blade with the brush.